Virginia, Auburn, Texas Tech, and Michigan State are the only teams who have survived March Madness thus far. The 2019 NCAA Tournament began on March 19th with 68 teams coveting a spot in the Final Four in Minneapolis. After two weekends of madness, the stage is set. This year’s Final Four, which begins on April 6th, features one usual suspect and three newcomers. The number 2 seeded Michigan State Spartans are making their tenth Final Four appearance, the first since 2015. On the other hand, number 5 Auburn and number 3 Texas Tech are in the Final Four for the first time, while number 1 Virginia is returning for only the third time and the first since 1984. Michigan State, despite being regarded as a college basketball power house, was not the most popular Final Four pick. This is likely due to the fact that they have disappointed recently by failing to get past the second round the last three years and because of the team they had to play in the Elite Eight in order to win the East region(more on that later). In the first round, the Spartans used a strong second half to avoid being the victim of yet another upset, defeating Bradley 76-65. The round of 32 was even easier, as they dispatched Minnesota 70-50. Tom Izzo’s team continued to look impressive in a 80-63 Sweet 16 win over LSU. However, Michigan State really showed their mettle by persevering to a 68-67 victory over number 1 seed and tournament favorites Duke in the Elite Eight. A late three pointer by senior Kenny Goins ended up being the decisive blow that saw them punch their ticket to the Final Four. If the Spartans are to make noise in Minneapolis, look for point guard Cassius Winston to be a big part of it. The Texas Tech Red Raiders rode their impressive defense to the West region title. They cruised past NKU, 72-57, and Buffalo, 78-58, in the first two rounds before facing 2 seed Michigan in a Sweet 16 matchup that was supposed to be hotly contested. The Red Raiders, however, ignored this narrative and made a statement by dominating the Wolverines 63-44. In the Elite Eight, they knocked off 1 seed Gonzaga and their top ranked offense 74-69, making Texas Tech history by clinching the school’s first Final Four bid. Shooting guard Jarrett Culver was key to this win, gathering 19 points, and is the catalyst of this Red Raiders team, as he will look to lead them to more history. Auburn, the SEC champion, is easily the most improbable member of the Final Four, but they made themselves known by ending the season of three of the four college basketball blue bloods and making it out of the Midwest region. However, they may have gotten their greatest scare in a narrow 78-77 win over New Mexico State in the opening round, as a wide open three ball and the hopes of an upset for the Aggies fell short as time expired. They avoided any such drama in round two by beating Kansas 89-75. The Sweet 16 brought a matchup with number 1 North Carolina that few saw the Tigers winning, but they pulled away in the second half to defeat the Tar Heels, 97-80. They then avenged a pair of regular season losses to Kentucky by winning a dramatic overtime thriller over the Wildcats, 77-71, in the Elite Eight. The back-court duo of Jared Harper and Bryce Brown played a big part in Auburn cutting down the nets, and they will have to be huge if the Tigers are to continue their impressive run. 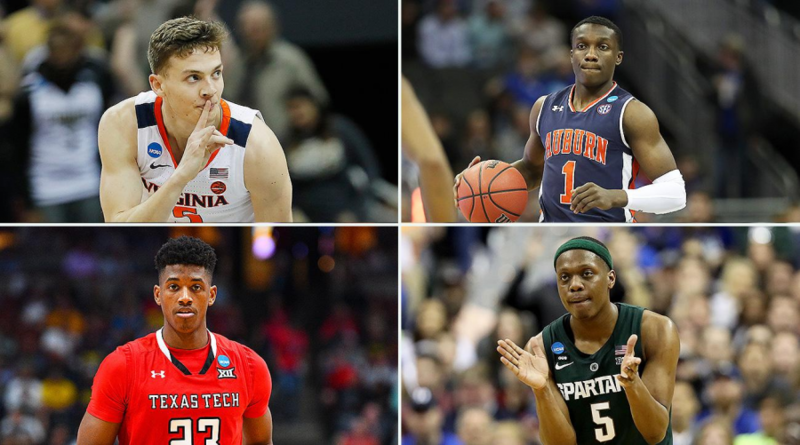 Virginia, the only one seed to make it out of their region, was still somewhat of a surprise because, like Michigan State, they have had their fair share of recent March Madness disappointment. The Cavaliers managed to shake this trend in 2019, however, and it began with a 71-56 first round win over Gardner-Webb that had some fans having flashbacks to last year’s debacle against UMBC, as Virginia trailed by six at the half. Their round of 32 victory over Oklahoma was less nerve-racking, as they won 63-51. They followed that up with a narrow 53-49 win over Oregon in the Sweet 16, setting up a matchup with Purdue. The Boilermakers gave them all they could handle, but a clutch buzzer beater by Mamadi Diakite sent the game to overtime, where Virginia prevailed 80-75, putting their tournament demons to rest. Virginia boasts a deep squad, including Ty Jerome, De’Andre Hunter, and Kyle Guy, giving them a solid chance to win the school’s first championship. Unlike last year, where 11 seed Loyola Chicago was an obvious long shot, every team in this year’s Final Four has a legitimate shot at winning it all. The semifinals will feature Texas Tech against Michigan State and Auburn taking on Virginia. The favorites in these games are likely the Spartans and Cavaliers, but all of these teams are so evenly matched that no one would be surprised to see any of the four hoisting the trophy in the end. This should make for an exciting Final Four.